Some criticize technology use in the classroom as a way to draw kids in with flashy colors, sounds, and games that don't promote hard work and deep learning. I see technology use in education as a way to inspire our learners to want to dig deeper into everything they learn. It can also help our students access resources and experts from the world beyond their school. So how can we make sure the EdTech is working for you and your students, and that it is not just another thing to add to the list of "things to do" in your classroom? If school and instructional leaders want teachers to take risks with new teaching strategies and technology in their classrooms, they have to model that risk-taking when we design their professional learning experiences. Instead of having "technology trainings" we should embed technology into all professional learning. After all, we want teachers to embed technology only where it fits well into their students' learning experiences. It makes sense for teachers to experience learning in the same way first. Not all teachers see the influx of technology into schools as a positive. Traditional teacher-centered education models that seemed tried-and-true are being questioned. Help open up traditional mindsets by sharing encouraging stories, giving teachers time to tinker with new tech, and modeling the risk-taking you want from your teachers. Kyle Pace and I shared our experiences and ideas for how to make this happen. The ideas are realistic and really work. Now, if the teachers and students in your school are going to start using devices, apps, and programs more, they need to be prepared to be positive and responsible users. Technology can be empowering and can unleash creative genius, but it can also be distracting and even addicting. My colleague, Julie Cremin, and I developed a professional learning model that empowers teacher to integrate digital citizenship vocabulary and themes in every content area. It also means teachers empower their students to use, discover, and create with technology while staying safe and secure. While professional learning can inspire teachers, it is the teachers that can inspire students. Push yourself, and encourage your fellow teachers, to give students access to high-quality interactive online resources, give them choice about how they show their learning, give them feedback as they struggle through the learning process, and then celebrate and reflect on what they create. It may sounds like a tall order, but it can be done in a 4 step process. Want to see some examples of how students can benefit from this process? Check out my TEDx Talk. It isn't just their final products that will amaze you, they will also find a way to build a classroom community because they grow accustomed to struggling, learning, and celebrating together. As schools start thinking about putting devices in student hands, they need to consider which device is the right choice for each age group, the resources they must access, and the tools they should be using to refine their skills. Even if you cannot purchase any more devices for this school year because of budget deadlines, this article from ConnectSafely can help you determine how to best budget for next year. Once the device is purchased, there are thousands of apps for technology directors and teachers to comb through. How can we decide which will both promote student learning and keep our students safe? When it comes to pedagogy and district goals, this 10 question checklist – created by Ross Cooper and I – can help guide the way. When it comes to data privacy, classroom teachers don't have to leave it to administrators and tech directors alone. Every educator should play a role. ConnectSafely and Future of Privacy Forum worked together to publish this guide for educators that can help. Entrepreneurs and innovative classroom teachers are always dreaming up the next exciting trend in EdTech. But if that trend has the potential to truly improve student learning, we should speak up about it. Today's trends include augmented reality and virtual reality. Are these really just games, or are they powerful learning tools? Try them with your students and ask them with they think. This EdSurge article has a few ideas to get you started. You and your students should decide if they're worth the hype. Then share your findings. Looking to inject more student voice into how technology is used school-wide? A student-driven help desk might be the answer. Some school call them innovation labs while others refer to them as technology teams. The exact name doesn't matter much. What does matter is that a group of committed students get to consistently tinker, create, and share their ideas with their teachers. Check out this EdSurge article to hear directly from students who have been part of pa program like this. If they value the opportunity, would your students value it too? Once you and your fellow educators and students have found success with EdTech this year, share it! Parents and other community stakeholders will feed off the energy your school is building. Educators far and near will learn from you and their students will benefit as well. School leaders like principals, department chairs, and curriculum supervisors can get the movement started with the ideas in this post from Corwin-Connect. If you or others in your school community are nervous about sharing publicly on social media, ConnectSafely has a guide written especially for educators. It provides a realistic perspective on the benefits and risks of using social media to share student work and school happenings. Just remember that if the educators working in the school with the students don't tell their stories, either no one will know the great things students are doing or someone else will tell their own version of those stories. Educators are a hopelessly optimistic bunch. Let's spread that optimism. 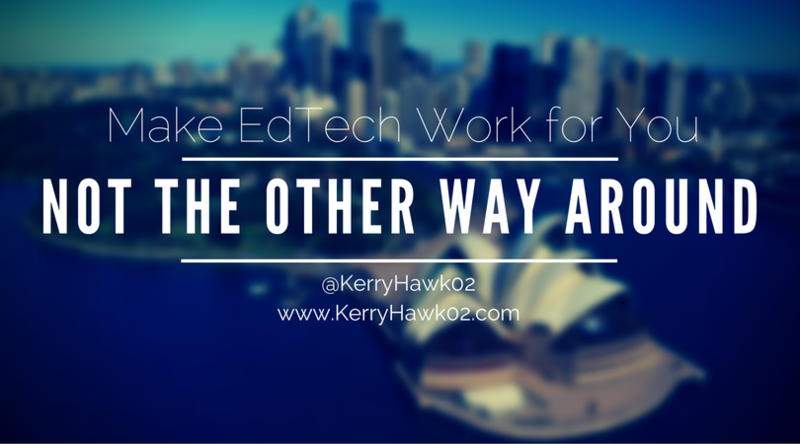 Make sure EdTech is working for you, not the other way around.